March has finally arrived! Do you know what that means!? For starters, the re-opening of Saltwater Farm Vineyard my friends! Come one, come all – our 2013 season kicks off Friday, March 15th in the tasting room. If you’ve never been before, now is the time. What sounds better than a glass of wine enjoyed by our toasty fireplace with panoramic views of the vineyard? Oh I know, all of that coupled with The Choos! This awesome band will perform Sunday, March 17th from 3-5pm. It’s going to be a good time so mark it in your calendar and come hang out with our super cool crew. While we’re on the topic, I have another little announcement that I’m kinda-sorta stoked about. Saltwater Farm Vineyard is now featuring Smashed Garlic on the website, a huge thank you to Michael and Merrily for their support. Check us out www.saltwaterfarmvineyard.com/links.html !!! Ok, now that I got all that excitement out of my system, let me ramp back up by reminding you March is also corned beef month. Umm salty beef and potatoes? YES and YES! You can be sure that I will make it at least twice because I just can’t help myself. I may also be taking on a second marriage with a few choice pieces of gym equipment because of my corned beef habit. Oh well! Before I go, I have a breakfast quickie for you. We make smoothies in our house every morning and have been on this kick since October of last year. Over the last few months I’ve upgraded my equipment and some of my ingredients. The Vitamix has demonstrably earned its place on my (extremely limited) countertop, it is a beast and used daily for all sorts of things. No, I do not work for this company but I will proudly back them. The machine annihilates everything I put into it… if I want it to. It creates a texture unmatched by blenders and has additional health and nutrition benefits which the traditional blender and Ninja are not capable of. My smoothies don’t separate, I don’t need ice, and I can have breakfast ready in under 1 minute. These machines might be expensive but they last and last, if you find a used one for sale – buy it so long as it turns on. This appliance goes beyond breakfast smoothies, it champions homemade ice cream, baby food, soups, raw foods, and juicing. Deep breath – It frictions cooks sauces, and you can even grind your own grains to make flour – the list goes on! 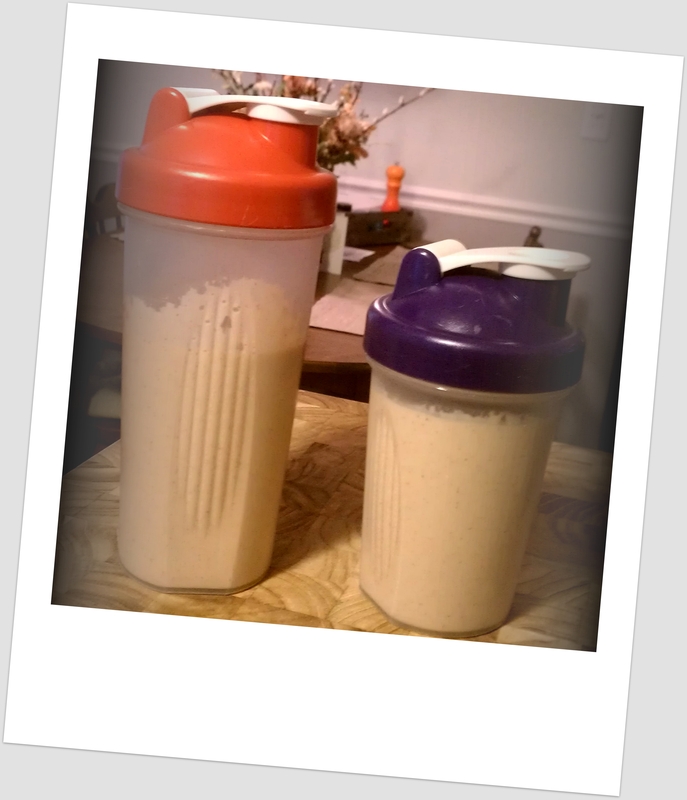 Here is a nice comparison for those interested: gotgreensrevolution.com/Vitamix-vs-Ninja-Review.html. You’re going to like it, promise! I pour the kefir in first, and then everything else goes on top. I put the top on, and flip the switch for approximately 30 seconds. Boom, breakfast made and I’m free to go about getting ready for work. It tastes good. That might be enough for you but there’s more! This keeps me full and energized for hours while low in fat, low in sugar, and makes my digestive system happy. Plain unsweetened kefir – a minimally processed cousin to yogurt that is higher in protein (11g/serving) and probiotics if you dig that sort of thing. Another bonus is that even though it’s high in calcium and made with milk, this is a lactose free product. Kefir is also a good source of vitamin A, a fat soluble vitamin vital for eye and vision health. Vitamin A also lessens the risk of night blindness, something that is a concern of mine. 110 calories, 2g fat, 3g inulin, and no added sweeteners. *A gluten-free product that Celiac’s can rejoice about, kefir is a great supplement for them. Chocolate PB2 – a powder form of peanut butter with 85% less fat calories. No Saturated fat, free from chemicals, preservatives, and artificial sweeteners. A 2 tbsp serving provides 4g of protein and only 45 calories, 1g fat. You can also buy this in plain peanut butter flavor. Bobs Red Mill Ground Golden Flax – High in fiber and omega 3 fatty acids (a healthy fat) as well as phytochemicals called lignans (a natural antioxidant). Flax seeds have 132% daily value of Omega 3’s vs. 61.2% present in Salmon, plus who wants to eat salmon every single day?! Moving on, you’ll ingest 4g of fiber, 3g of protein, 89mg of potassium for only 60 calories and 4.5g of fat (none of which is saturated). Flax aids in digestion and may help reduce your LDL cholesterol levels – the bad kind. This meat-eater just had blood work done for a routine check up, my cholesterol registered at 132! Organic quick oats – half of a serving per person gets you 2g of soluble fiber which helps lower your LDL cholesterol when eaten daily. 132 friends!! 2.5g protein, 10% of your daily Iron for only 75 calories and 1.5g of fat. PLUS when combined with banana, it keeps me full and sated until lunch. Banana – Provides more soluble fiber, natural sweetness, lasting energy without the caffeine crash, supports heart function, aids in digestion, and offers many vitamins. I’ve also read that bananas can lift your spirits because of the tryptophan – a mood regulating substance. So there you have it – my breakfast breakdown. 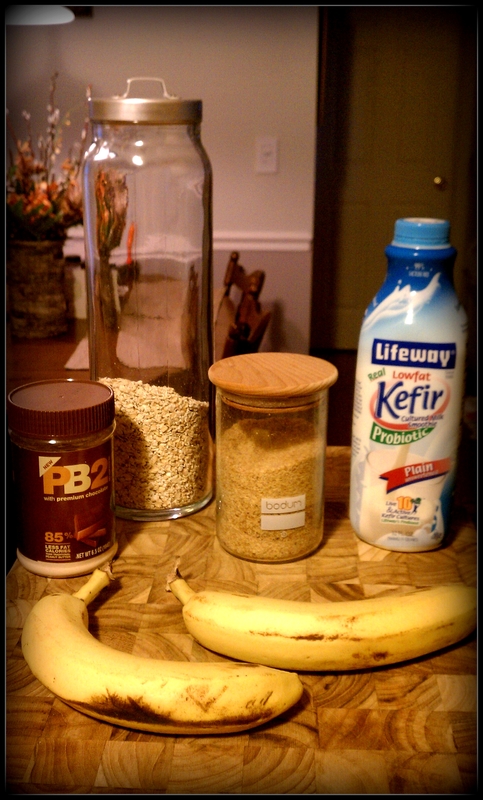 This entry was posted in Breakfast, Healthy Habits and tagged Gluten Free, Smoothie on March 1, 2013 by NewEnglandGirl.